The latest rubber offers incredible wet weather grip, but we often wonder whether it helps to be a bit obsessive about riding a bike. Obsessive people think about every detail, and test the smallest little things to see if they make an improvement. Nowhere is that mindset more useful than when it’s pouring with rain. 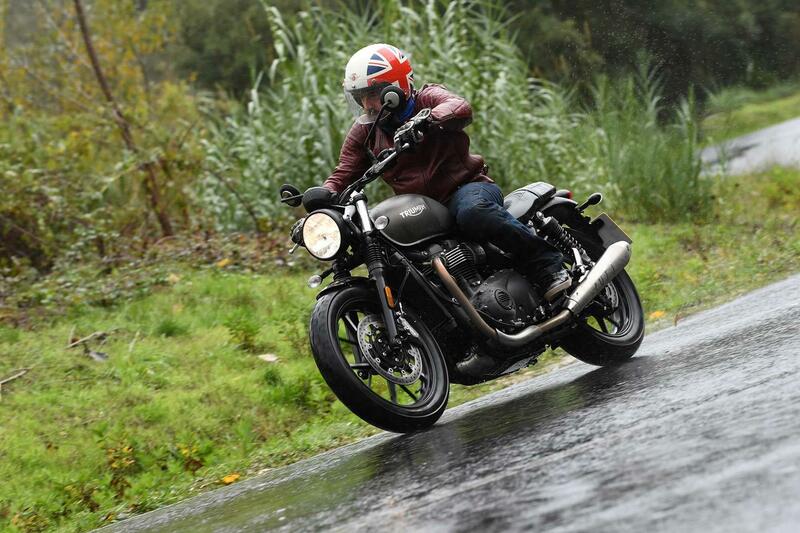 The critical problem with rain riding isn’t tyre grip or smooth throttle response. It’s being able to see where you’re going, and concentrate. Being dazzled by oncoming traffic in the dark, or making a poorly-timed overtake because you’re freezing your tail off – these things are far more problematic than a slippery road. Clear vision is even more important in heavy rain. This is doubly important as rainwater also tends to cling to a mucky visor, further reducing what you can see. Use an anti-fog device such as a Pinlock on your visor to prevent it steaming up, and try to avoid opening your visor, as once rain gets on the inside it can be very hard to clear. How far should I be from the vehicle in front? You need to double your braking distance in heavy rain for two reasons. Firstly because you physically can’t stop as quickly as in the dry and, secondly because your visibility is impaired, which will give you less time to react. Which lane is safest when it's wet? Generally speaking, on dual carriageways and motorways the inside lane holds the most water. This is because trucks often create two ‘gutters’ – deeper channels of water where the lorry wheels run. Beware, especially when moving back into this lane. Dips or undulations in the road will hold water. One classic location is where a road passes through a tunnel under a larger road. Take particular care in autumn as leaves can block drains causing flooding. How do I ride a motorbike in deep water? With extreme caution. Are there any obstructions you can’t see? Do you know for certain how deep it is? If you decide to enter, do so slowly and try to avoid braking. Over the years tyre development means the level of grip in cold and wet conditions has improved vastly. Even so, sport or trackday tyres aren’t going to work as well as all-purpose/touring tyres in the wet. If you intend to ride throughout winter choose the correct rubber. The difference between a trackday tyre and a winter tyre in the wet is huge. Tyre pressure is vital too; the grooves in the tyre won’t work correctly in the wet if the pressure is too high or too low. Do I need electronic aids on my motorbike? From 2016 when Euro4 regulations came into effect, it became a legal requirement to have anti-lock braking systems (ABS) installed on all new bikes over 125cc capacity, and for bikes of any size you also now need either ABS or a linked braking system. If you’re lucky enough to have rider aids on your older bike, use them. Turn up the traction control, turn down the power and make sure the ABS is activated. All too often we forget about rider aids or just don’t bother. If applicable, also adjust the suspension as some bikes have a wet mode which makes the suspension softer. How do I brake in the wet on a motorcycle? Like most other things in life, braking in the wet is straightforward if you plan ahead. The first part of the plan is to practice applying the brakes on a traffic-free stretch of road with a consistent road surface. Start out slowly, focussing on the front brake and building up the lever pressure gradually so that you get more and more of a feel for the power of your brakes and the feel of the tyre on the road. When a tyre is getting close to skidding it loses speed rapidly before lock up. If you are focussed on your braking you'll feel it in your hands and all you've got to do is release lever pressure and the tyre will speed up and you'll continue to slow down in control. And the great thing about the wet is that although the ultimate limit is earlier, the zone when it starts to break away is wider so you've got more time to react. But that doesn't mean you can ride up close to other vehicles because the fact is they can stop harder than you can and if you don't leave plenty of room ahead you could be picking your bike up off the floor, so make sure you plan to have plenty of distance between you and other vehicles. Be smoother too, as sudden changes of input will unsettle your bike and make it harder for you to keep that vital feel for what's happening under your backside. 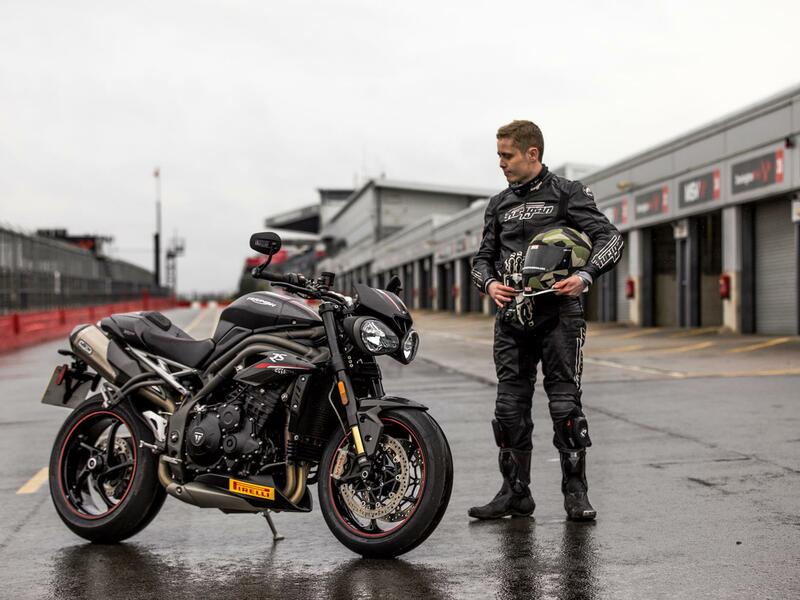 When you are braking more smoothly and gently in the wet that will bring your rear brake into play more as there’s less weight transfer, so get a feel for that too, making sure the pedal is positioned just under the sole of your boot. 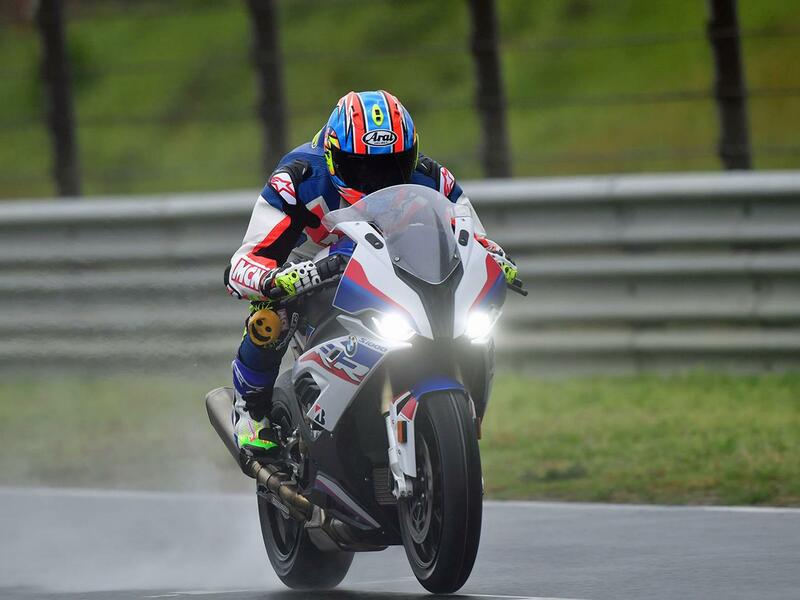 Don’t let rain wreck your trackday! 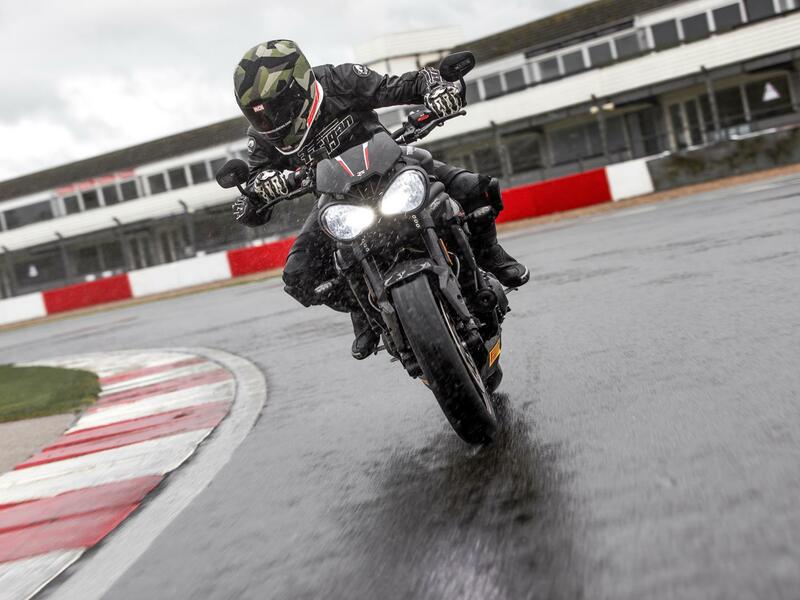 Here are some tips to help make you a wet circuit master, from MCN's very own Chief Road Tester, racing and track driving specialist, Michael Neeves. 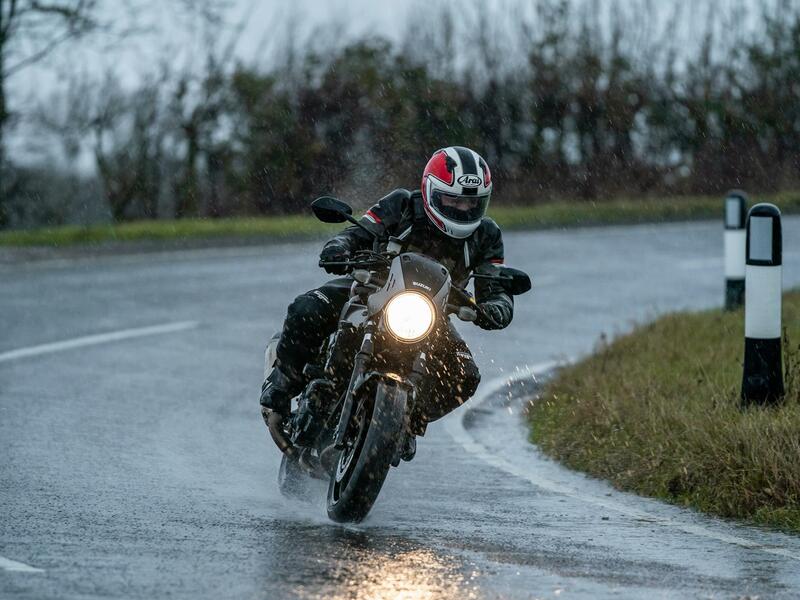 Rain doesn’t need to spoil your trackday but the key to safe riding in the wet is being smooth on the controls and shifting your weight around. Concentrate on the straights; braking and accelerating hard when upright, and taking it steady in the corners. Gently release the throttle and wait for the weight to transfer to the front tyre before braking. Squeeze the front brake lever lightly at first, to get the front tyre dug in, then progressively harder, feeling for grip. Finish braking before tipping-in. Blip the throttle on down-changes to reduce engine braking. Do your turning off the brakes and with a neutral throttle to give the front tyre the best chance of gripping. To stabilise the bike, and give you one less to think about on the way in, hang-off way before the braking zone so you’re in the correct position before the turn. Keep the bike as upright as possible into, through and out of the corner, taking pointy V-shaped lines. Wide, swooping arcs means leaning on the front tyre’s tiny contact patch which is risky. Remember where the slippery bits of track are and mentally log them for the next lap. You might have to ride off-line to avoid the smoothed-out tarmac of an apex, and you should always accelerate gently out of an off-cambered corner. Avoid painted kerbs like the plague and watch out for painted grid spots. Build confidence by deliberately making the rear wheel spin in a straight line on a long, un-cambered piece of track. You’ll be surprised by how much it actually takes to get the rear to break traction. 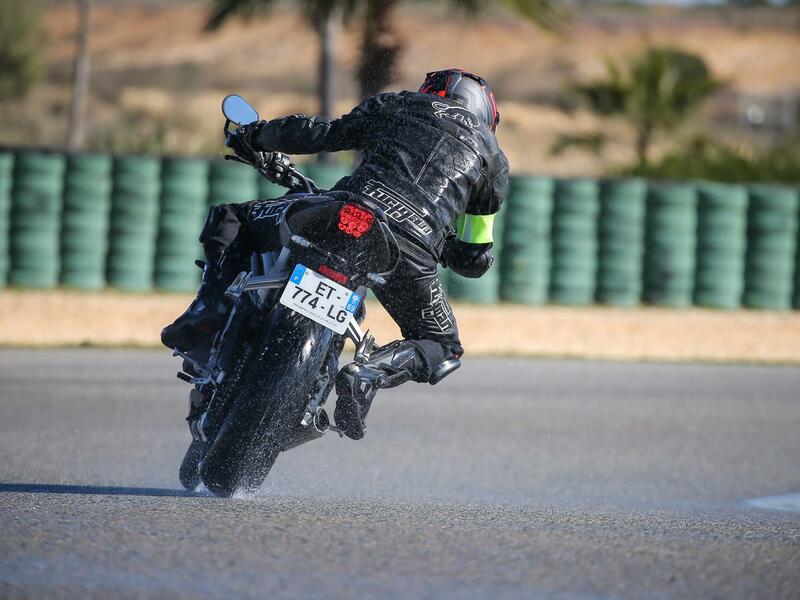 Hang-off to reduce your lean angle and gently pick up the throttle to get the weight transferred to the rear tyre. Only accelerate hard when the bike is completely upright. 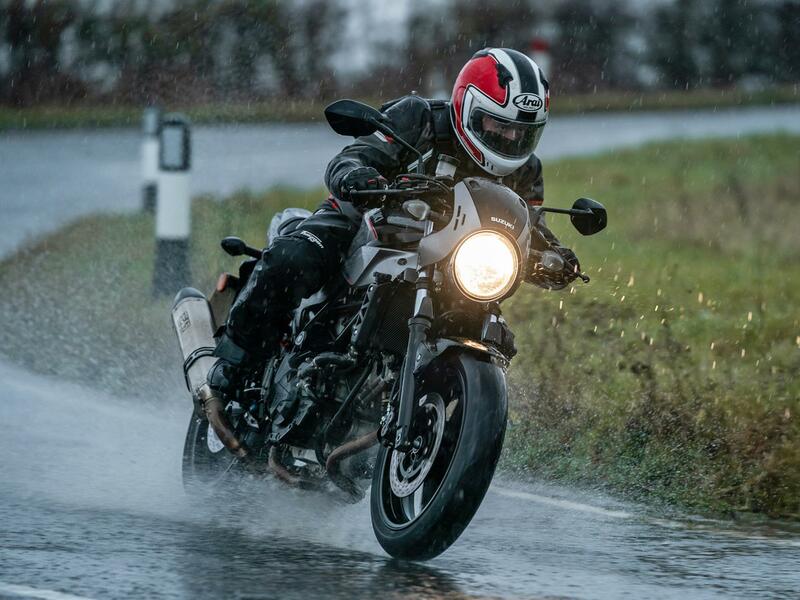 Sports touring rubber is the most suitable in the wet – sticky trackday tyres simply won’t work. You could use tyre warmers on wets (on a low heat setting) to make them pliable, but as soon as you take them off they’ll quickly lose heat as you go from the paddock to the track. It’s better to start cold and gradually build speed, adding heat, grip, and confidence as you go.